Click on a menu category to see all the delicious food New Brother's has to offer. 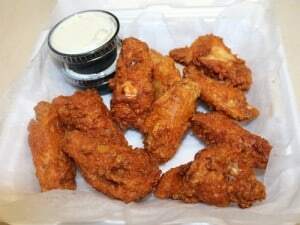 3 chicken wings, 3 mozzarella sticks, 3 jalapeño poppers, 5 breaded fried mushrooms with ranch, bleu cheese & marinara sauce for dipping. A mixture of fresh vegetables, lettuce, green peppers, onions, olives, carrots, mushrooms, cucumber, tomatoes & a choice of dressing. Grilled chicken over our fresh garden salad & a choice of dressing. Strips of ham, turkey, cheese & sliced hard boiled egg served over our fresh garden salad & a choice of dressing. Freshly prepared tuna salad over our fresh garden salad & a choice of dressing. Strips of bacon, over fresh lettuce & tomato with choice of dressing. Feta cheese, lettuce, tomatoes, red onions, green peppers, kalamata olives, fire roasted red pepper, cucumber & Greek dressing on the side. Grilled chicken served over fresh Romaine lettuce, homemade croutons, imported pecorino Romano cheese & Caesar dressing on the side. Spinach, sliced hard-boiled egg, bacon, tomatoes, onions, raisins and walnuts. Served with raspberry vinaigrette on the side. Ham, salami, cucumber, tomatoes, black olives, roasted red peppers, aged provolone cheese & pepperoncini peppers over fresh iceberg lettuce. Served with our house oil & vinegar dressing on the side. Fried chicken breast tossed with spicy buffalo sauce. Served with iceberg lettuce, tomatoes, cucumbers, pepperoncini peppers, bleu cheese crumbles & a choice of dressing. Mozzarella cheese, pepperoni, sausage, ham, salami & pizza sauce. Glazed with seasoned garlic sauce sprinkled with imported pecorino romano cheese. 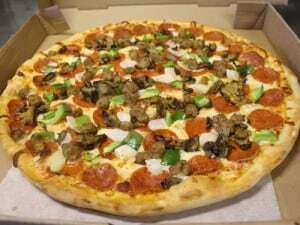 Mozzarella cheese, pepperoni, sausage, green peppers, onions & mushrooms. Mozzarella cheese, fresh tomatoes, onions, broccoli, a touch of garlic & herbs. No pizza sauce. 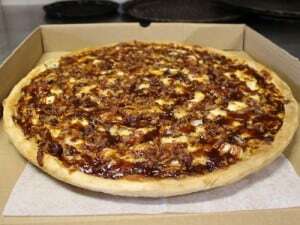 Mozzarella cheese, BBQ sauce, topped with all-whit chicken, bacon & onions. Mozzarella cheese, pepperoni, ham, salami, bacon & sausage. 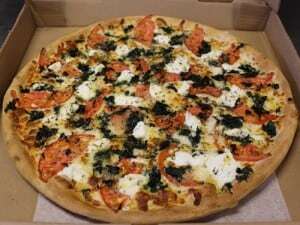 Mozzarella cheese, ricotta, garlic, spinach, fresh tomatoes & Italian herbs. No pizza sauce. Mozzarella cheese, ham & pineapple. No pizza sauce. Mozzarella cheese, buffalo sauce, topped with all-white chicken, black pepper & onions. 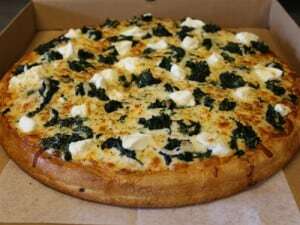 Minced garlic, extra virgin olive oil, fresh spinach leaves, roasted red peppers, kalamata olives, feta cheese & mozzarella cheese. Chopped steak, onions, green peppers, American & mozzarella cheese. Mozzarella cheese, chicken, spinach, bacon & Alfredo sauce. Baked to perfection. Glazed with seasoned garlic sauce, sprinkled with imported pecorino Romano cheese & served with our signature marinara sauce for dipping. Additional toppings $0.99 (small) & $1.59 (large) each. Filled with mozzarella cheese, pepperoni, ham, salami, green peppers & pizza sauce. 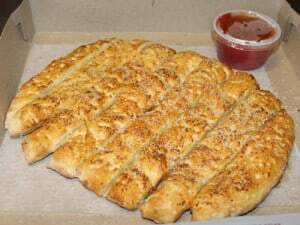 Filled with mozzarella cheese, steak & pizza sauce. Filled with mozzarella cheese, spinach, onions, green peppers, black olives, mushrooms & pizza sauce. Filled with mozzarella cheese, ricotta cheese & ham. Layers of pasta, ground beef, assorted cheeses. Topped with tomato sauce & melted mozzarella cheese. Ziti mixed with ricotta cheese & marinara sauce. Smothered with mozzarella cheese & baked to perfection. 4 Pasta shells filled with assorted cheese & spices. Topped with tomato sauce & mozzarella cheese & baked to perfection. Your choice of cheese or meat filled pasta pillows, smothered in our homemade tomato sauce, topped with mozzarella cheese & baked to perfection. Deep-fried, sliced eggplant smothered in our homemade tomato sauce, topped with mozzarella cheese & baked to perfection. 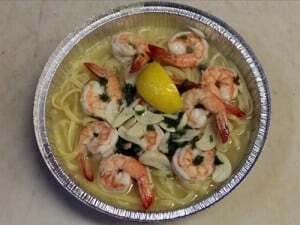 Served with your choice of Spaghetti or small house salad. Tri-Color cheese tortellini with peas, spinach and tomatoes. Served in a cream rose sauce. 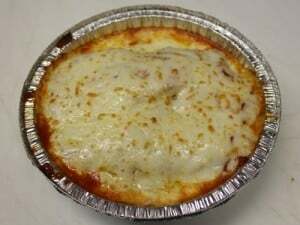 Prime chicken lightly breaded, topped with tomato sauce & mozzarella cheese & baked to perfection. Served with your choice of spaghetti or small house salad. 10 Peeled and de-veined large shrimp, sautéed in white wine, lemon & garlic butter sauce. Served over a bed of linguini. Thick fettuccine noodles smothered in a rich creamy alfredo sauce, topped with grilled chicken & freshly steamed broccoli. 10 Large peeled and de-veined shrimp, with Fettuccine pasta, freshly steamed broccoli, smothered in a rich creamy alfredo sauce. 10 Large peeled and de-veined large shrimp, sautéed in garlic and a blend of spicy seasonings, smothered with our homemade tomato sauce and served over a bed of linguini. Add a small house salad to any entree for $1.99 extra. At your request, we can add lettuce, tomatoes, onions, mayo, green peppers or black olives to any sub at no additional charge. Tender seasoned steak & American cheese. Tender seasoned steak, American cheese, grilled onions, mushrooms & green peppers. Chicken steak & American cheese. Tender seasoned chicken steak, American cheese, grilled onions, mushrooms & green peppers. Add fries & a 12oz drink to any sub for just $1.99 extra. Served hot or cold. Ham, salami, capicola, provolone cheese, lettuce, tomatoes & oil & vinegar. Served hot or cold. Ham, turkey, roast beef, bacon & provolone cheese. Served hot or cold. Provolone cheese, lettuce, tomatoes, olives, onions, green peppers & mushrooms. Tender seasoned steak, tomato sauce, & mozzarella cheese baked to perfection. Served hot. Sautéed Italian sausage, onions, green peppers & tomato sauce. Served hot. Meatballs smothered with sauce & mozzarella cheese. Baked to perfection. Served hot. Breaded chicken breast smothered with marinara sauce & mozzarella cheese. Baked to perfection. Served hot. Sliced eggplant smothered with marinara sauce & mozzarella cheese. Baked to perfection. 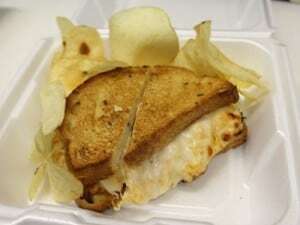 All sandwiches come with your choice of regular or BBQ chips (excludes Grilled Cheese). Served with chips. Lamb meat, feta cheese, lettuce, tomatoes & sautéed onions wrapped in a pita. Served with cucumber sauce on the side. Served with chips. Grilled chicken with lettuce, tomatoes, green peppers, mayo & ranch dressing wrapped in a pita. Served with chips. Thin sliced corn beef, sauerkraut, thousand island dressing, melted provolone cheese & served on toasted rye bread. Served with chips. Bacon, lettuce, tomatoes served on toasted white bread. Served on a toasted Kaiser roll. At your request, we can add lettuce, tomatoes, onions, pickle, mayo, ketchup & mustard at no extra charge. Add fries & a 12oz drink to any burger for just $1.99 extra. All Croissant Sandwiches come with Romaine lettuce, tomatoes, onions, mayo & your choice of regular or BBQ chips. 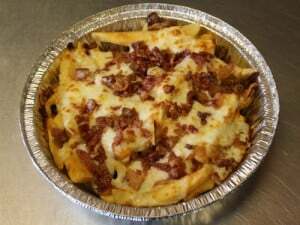 Ham, turkey, bacon & your choice of cheese. Fresh homemade tuna & your choice of cheese. Tender grilled chicken breast & your choice of cheese. Sliced ham & your choice of cheese. Sliced turkey breast & your choice of cheese. Served with marinara sauce & garlic bread. All menu prices are subject to change without notice. Prices DO NOT include tax or delivery fee.